Group Resources gives you the option to share your magicka and stamina values with your group in real time. Beneath the hood, this addon relies on the newly released LibGroupSocket, which manages the collection and sending of data, so other addons can easily integrate the feature. Group Resources only manages the bars for the PC and console vanilla group frames, this means you won't need it if you are using group frames from other UI addons. If you don't want to disable the group frames from other addons until they support this, you can still send your values to group members, but you won't see them in your own UI. In order to follow ZOS' opt out policy (brought up in regards to Group Damage), LibGroupSocket gives you fine grained control over what data you share with your group. Per default it automatically disables the sending of all data when you leave a group, or quit the game. The sending of data is disabled right after you install the addon. or enable it in the settings menu for LibGroupSockets. Sending will automatically disable itself again when you reload the UI, restart the game or leave a group. This is in order to prevent involuntarily sharing data with the wrong people. If you want LibGroupSockets to remember the settings you have chosen, you need to install it as a stand alone addon, otherwise it will revert to its default values when the UI is next loaded. You can also choose if you want to share your maximum stamina and magicka values with group members, but this is off by default and only will be useful in combination with other unit frame addons that will show the values. Settings for LibGroupSocket won't be saved unless you use the stand alone version. You can download it here. Would be awesome to integrate with LUI Extended custom frames, this is what I use all the time nowadays. @polysemy: I haven't had the time to make some yet. Will hopefully add them today. @MagiczneTornado: I think the main issue with GroupDamage was how it cannot be turned off if you do not consent to it, as it pulled the data directly from the API on the other players client. But we will see how it plays out. @baratron: Thanks for showing polysemy some pics. Having this feature added in other UI addons is the plan. The main functionality is in the LibGroupSocket library. GroupResources is more or less just an example on how to use it. Here's a screenshot of the mod in action. I'm also running FTC, AlphaTools and S'rendarr, all of which are visible on my screen. You'll see that three players in the group were sharing information with GroupResources and the other one wasn't. In order to get it to show up you have to disable FTC's own unit frames (for group and Trial, you can keep the others) and replace them with the default. I'm not a huge fan of the default... they're lacking too much information for a Healer. In particular you can't see if other players are running shields or not, which is pretty much essential when taking newbies through certain Vet dungeons and Trials. What would be awesome would be if someone would take this functionality and combine it with group unit frames like FTC's. @MagiczneTornado This addon is actually not for elitists, but aimed at casuals who do not use voice chat. 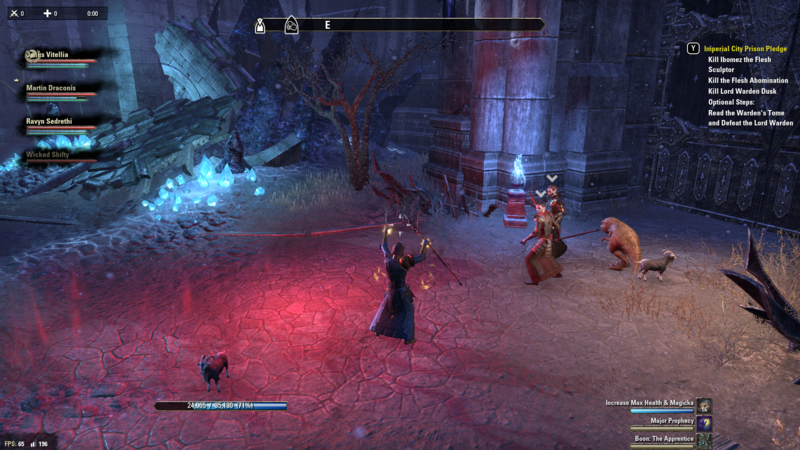 It enables the healer in a group to see how much resources a player has left and react to it. "Elitists" would share this information via TS, but now everyone can do that, even without voice chat. @timidobserver It is in real time. A DPS message type for LibGroupSocket is already being worked on in order to make it compatible with FTC's DPS sharing feature. 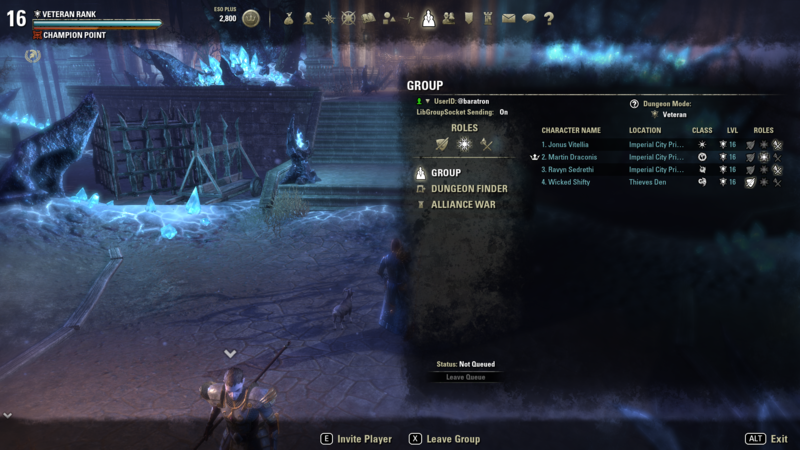 It will have similar options to the Group Resources, so players can control what is actually shared with the group (opt-in) like ZOS and the people complaining about GroupDamage wanted. I know that perfectly sirinsidiator, so was Group Damage addon, yet people who want to get carried through content without contributing anything will do everything to keep their status and not let anyone see how they perform. My personal opinion is that downloading the addon should be considered opting in, but yeh building the opt-in functionality into the actual lib will hopefully make it more acceptable to ZOS. Other than FTC, are you aware of any other DPS addons that are being developed using the sharing lib? That holds true for GroupResources, but the lib could be included in any other addon and then it would not allow you to opt out easily without the settings. I am not exactly sure what the state of the DPS sharing is. It's not made by me and the last time I heard anything was already more than a month ago. I am looking forward to a DPS meter using this. Is it capable of real time DPS sharing rather than only sharing once the fighting is over? The real time sharing is what made group damage awesome. Carebears are incoming "omgx elitists, ZOS plx remove"!